For some reason, when it comes to her red carpet looks, Chloe Moretz gravitates towards difficult pieces which isn't, always a good thing. The actress attended ELLE's 25th Annual Women In Hollywood celebration at the Four Seasons Hotel last night(October 15th) in LA. 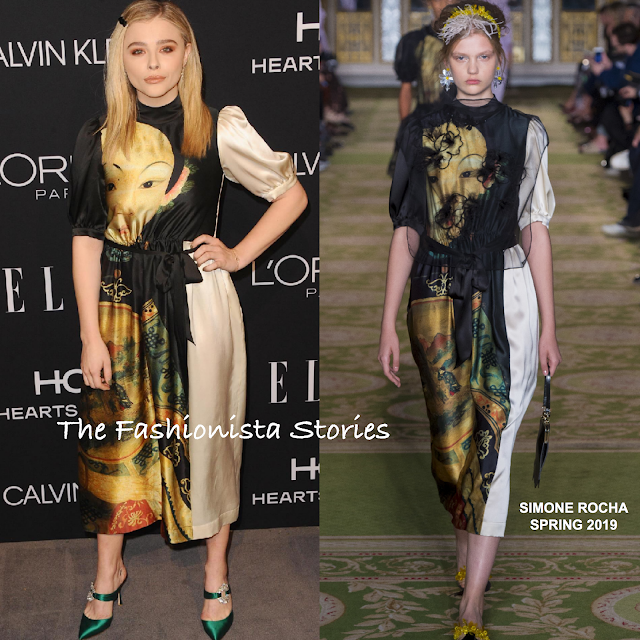 Turning to one of her go to designer brands, she wore a SIMONE ROCHA SPRING 2019 black & cream lady silk printed dress, featuring a mock neckline, a tie waist and balloon sleeves. The dress was layered with a black sheer tulle top on the runway which thankfully Chloe removed. While this is not the worst look but it's not the best either. The green satin embellished mules played off of the hue on her dress. I really think she can do so much better in the style department. Do you think Chloe pulled off this look?